About Us | Packaging Distributors Inc.
Packaging Distributors, Incorporated, headquartered in McGregor, Texas, manufactures check weighing, bulk packing, and infeed systems for the packaging industry. Our philosophy is to develop packaging line equipment that will perform under harsh conditions and continuous three shift operation, occupy a minimum amount of plant floorspace, and use standard industry controls. We take pride in the quality and craftsmanship of every machine that we manufacture. 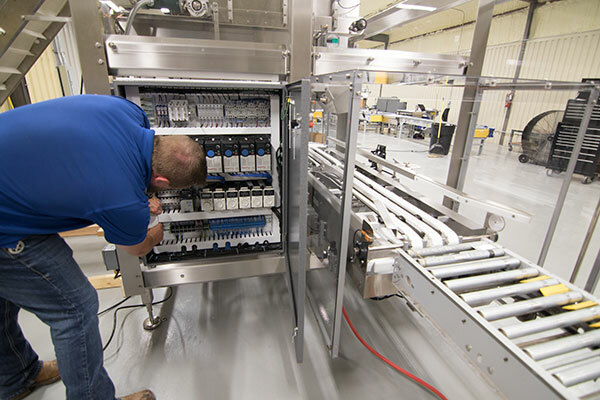 Each of our machines undergoes thorough testing before shipping to ensure reliability and minimize installation downtime. All of our equipment is completely documented and we use standard industry parts and suppliers to simplify spare parts procurement.